Jack is a solicitor within the property team. Jack deals with commercial property transactions from basic leases and assignments to site acquisition. 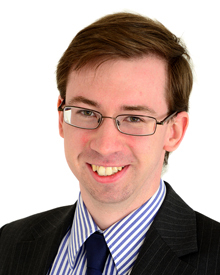 Jack supports Shaun Owen delivering top quality legal advice to many of our clients. Prior to dealing with commercial property matters, Jack has a wealth of experience handling residential property matters. Jack pulls on this experience to understand the pressures his clients are facing while taking a commercial and pro-active view on getting the deal done. Thanks for the great service I've received. As the man from Honda says, it's nice when things just work. I'll be back in touch next time I buy a house. You did a sterling job for us with the house – thank you for everything. I type this from the (grandly named, but very small) office – an achievement in itself! If I could find someone as reliable and conscientious to help me with the mountain of DIY jobs, then I would be a happy man…..